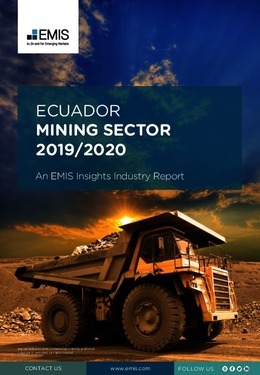 Although mining has taken place in Ecuador since precolonial times, the sector has never been a pillar of the economy, mainly due to an unfavourable government policy that has discouraged investments. In 2017, mining contributed to just 0.5% of the country’s GDP and 1.4% of national exports, generating a trade surplus of USD 227.7mn. A total of 13,146 people are directly employed in the sector, mostly in artisanal and small-scale mining operations. However, this situation is about to change significantly in the coming years, supported by an improved regulatory framework and growing investor appetite for new, cost-competitive mineral resources in a scenario of declining ore grades and maturing perations in other mining destinations in Latin America. This has also been confirmed by the Mines and Money mining forum, which in October 2017 recognised Ecuador as the most attractive country in the Americas for mining investments. This report provides a complete and detailed analysis of the mining sector for Ecuador. EMIS Insights presents in-depth business intelligence in a standard format across countries and regions, providing a balanced mix between analysis and data.